From Canine Good Citizens® to therapy cats, animals are known to have a healing power. It’s why so many pet adopters say, “I didn’t rescue him, he rescued me.” In the case of a Chihuahua named Nico, this mantra couldn’t be more true. Although the 7 lb. pup went through some tough times, he proved to be just what the doctor ordered for his new adopters. Here is their Happy Tail. Nico was purchased from a pet store by his previous owner a few years ago. 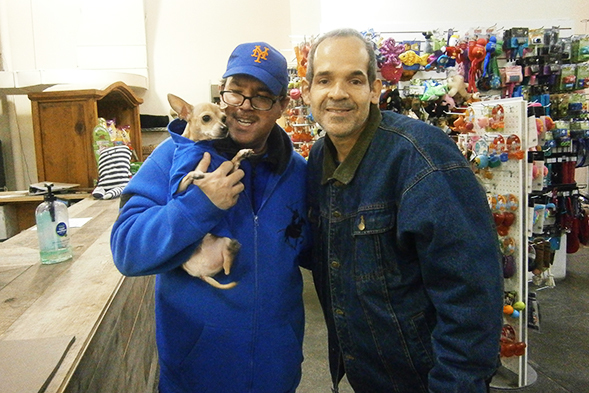 When that owner passed away in the fall of 2014, his family surrendered the tiny dog to the ASPCA. Though it must have been hard to lose his home, Nico was a trooper. A bit shy at first, he soon warmed up to the staff at the ASPCA Adoption Center, and we were confident that he would make some adopters very happy. On October 25, he did just that. While Michael admits that Nico seems grateful for his new forever home, he also acknowledges the great impact that petite pooch has had on their lives. “Nico is very good for my husband’s condition. He is very kind and humble,” he says. “Nico is happy with anyone.” We are so glad that this sweet dog is able to give and receive so much love, and we wish this happy family all the best in their new life together!